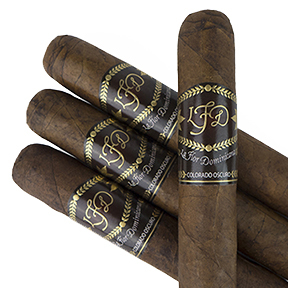 La Flor Dominicana cigars are known to be very full-bodied smokes, but the limited edition Colorado Oscuro cigar is considered to be the most mild of the powerful in Litto Gomez' stable of premium handcrafted cigars. The beautiful Colorado Oscuro's wrapper is an espresso-dark, toothy, and oily Ecuadorian Sumatra Ligero that perfectly complements the Dominican and Nicaraguan long-filler core and Dominican Sumatra binder. The subtle and balanced flavors of sweetness and spice mingle with cedar, toast, bitter chocolate, and espresso to make for an incredibly luxurious smoking experience. If you've been leery of smoking La Flor Dominicana cigars due to their strength, the Colorado Oscuro is the cigar to try.